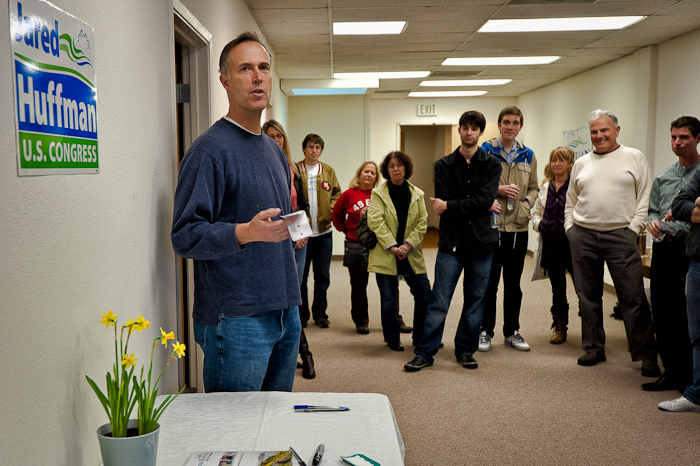 Jared Huffman addresses volunteers at opening of his San Rafael headquarters. I offered to be a volunteer photographer at the Jared Huffman for Congress organizational meeting in San Rafael yesterday. I have no idea if the campaign is going to take me up on the offer, but I sure hope so. He looks like a winner and I’d like to be there clicking away at the finish line. I’m skeptical about most politicians, but Huffman seems different. I first heard him speak about six years ago, when he began his campaign for the California Assembly. There was something natural and unaffected about his presentation, with none of the pomposity you often hear from ego-driven Americans running for public office. And I agreed with his positions on every issue he addressed. At the time I was working at San Quentin Prison, and so he really caught my attention when he clearly articulated the reasons for shutting down this obsolete structure and doing away with California’s flawed death penalty. Six years later, after a successful career in the Assembly, he’s now turned his attention to national issues, and again he matches my interests and values, with strong positions on the environment, health care, jobs, education, minority rights, and sensible debt reduction. And after six years of mixing it up with swarms of California politicians, the crud doesn’t seem to have rubbed off on him. He’s still the brilliant, effective, but low-key “Mr. Nice Guy” I remember. I’m sure he’s going to be elected to Congress with or without my photos, but I’d be pleased if I could play some small part.